It was a historic night in the Hive as Moorefield Girls Basketball upset the tenth-ranked Lady Mountain Lions for the first time since 2003 by a score of 62-59 guided by junior Lindsey Rinker’s game-high 31 points which helped her eclipse the 1,000-point career milestone on Wednesday. Rinker is the seventh player in program history to reach the 1,000-point scoring club, joining all-time leader Jess Fisher with 1,406 points, Cindy Martin, Katie Fisher, Jodie Bosley, Robin Cole and Tara George. Moorefield was the region champion and reached the state tournament the last time the Lady Yellow Jackets defeated Tucker County in 2003 with Fisher leading the team. 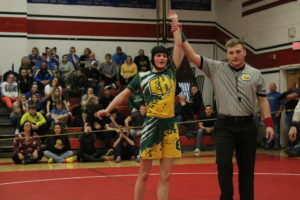 Despite the loss to the Lady Yellow Jackets (10-9), Tucker County (11-6) moved up in the state rankings from tenth place to eighth place overall. “We came out and jumped out on them quick and we were moving around defensively. That’s the kind of energy we need every night. 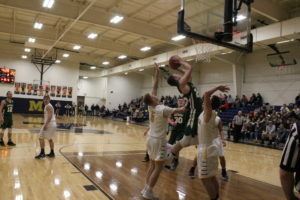 We shot the ball well and rebounded well, there was only a one point rebound difference,” Moorefield Girls Basketball coach Paul Keplinger remarked. Entering the game, Rinker needed only 13 points to reach the 1,000-point plateau and the energy from the stands sent a good vibe that it would happen as it was electric inside the Hive. After the opening tip-off, Tucker County’s Terra Kuhn ripped the ball away from Moorefield’s Lexi Gilhuys, then her pass was kicked out of bounds by Rinker. Kuhn responded with a jumper at the 7:20 mark, then Riley Evans stole the ball for the Lady Mountain Lions and Rinker kicked the ball on defense again. A foul by Moorefield’s Gianna Fair put Kuhn on the free throw line for two successful shots to put Tucker County ahead 4-nil at the 7:05 mark. A missed perimeter shot by Rinker turned into a collective sigh from the stands, then Tucker County’s Aliyah Plum made the rebound before Fair blocked a shot on the other end sending the fans into a loud cheer with Madison McGregor recovering the ball for the Lady Yellow Jackets. Both teams missed a couple of baskets and committed turnovers over the next minute which included a steal by Gilhuys. Rinker collected a defensive rebound, then scored an old-fashioned three-point play at the 5:18 mark to cut the deficit to 4-3 as the fans cheered and tallied the countdown. 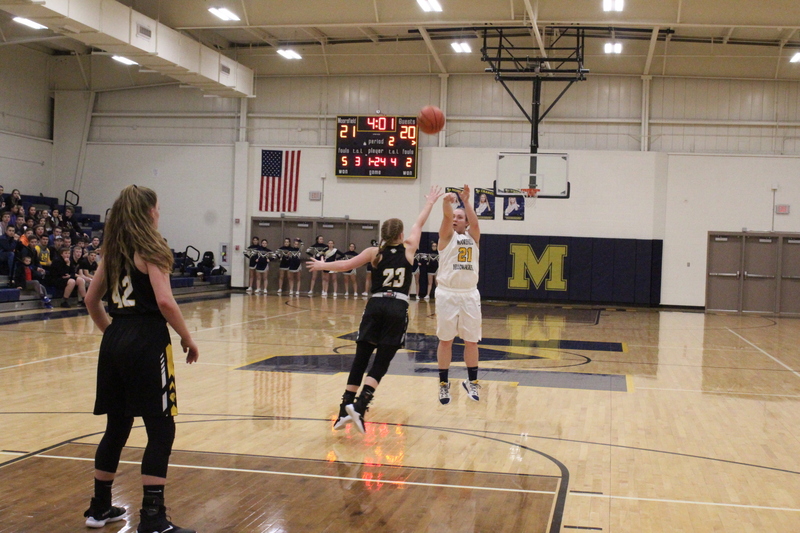 McGregor swiped the ball and scored on a layup 15 seconds later to put Moorefield on top, 5-4. Fair blocked shots twice on defense as the Moorefield student section went nuts. Rinker scored on a putback to extend the lead, but the Lady Mountain Lions answered with a game-tying 3-pointer by Evans at the 4:08, 7-all. Moorefield broke the press and McGregor nailed a 3-pointer to regain the lead at the 3:44 mark. Under the Lady Yellow Jackets pressure, Tucker County couldn’t get past mid-court for a violation. After a Moorefield foul, Rinker stole the ball which led to a missed shot and around by Tucker County’s Katelyn Surguy. Fair blocked another shot and Gilhuys recovered the ricochet, but the Lady Yellow Jackets hit the rim. Tucker County collected the board and London Hood scored moments later to cut the lead to 10-9. A pass near mid-court to Rinker leaping in the air went behind the line for a backcourt violation, then Rinker made a defensive rebound leading to a baseline layup by Gracie O’Neill at the 1:35 mark. Gilhuys stole the ball and fed Rinker for a 3-pointer at the 1:11 mark to put Moorefield ahead 15-9. Gilhuys collected a rebound, then Tucker County’s Kelcee James made a block before Moorefield snatched the ball back on a steal by Remi Hinkle. Rinker drew a foul and notched both free throws with 40 seconds left in the first period to need only three more points to reach 1,000 as the lead grew to 17-9. 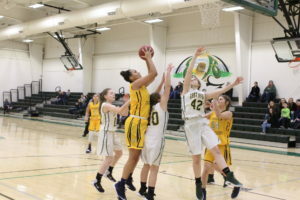 Tucker County’s Anna DiBacco added a putback on the next series as the Lady Yellow Jackets took a 17-11 edge into the second period as a turnover and a steal by O’Neill didn’t create anything in the waning seconds. After a handful of missed baskets to start the second period by Tucker County and Moorefield, Kuhn was fouled and made one free throw. O’Neill denied a shot attempt which turned into a jump ball situation for the Lady Yellow Jackets, but Moorefield missed twice. Kuhn hit a jumper for the Lady Mountain Lions to cut the deficit to 17-14 at the 6:34 mark, but Moorefield responded with a jumper by McGregor a dozen seconds into the next possession. Tucker County’s Plum and Surguy scored baskets over the next minute and change with the latter coming off a steal by Kuhn snatching the ball out of O’Neill’s hands. A layup by Gilhuys put the Lady Yellow Jackets up 21-18 at the 4:38 mark, but Tucker County answered with a jumper by Plum. Rinker knocked down a 3-pointer from the top of the key for her 1,000th career point which gave Moorefield a 24-20 lead at the 3:59 mark of the second period as family and friends cheered loudly with signs displayed in support. “It was a very special moment for me and my teammates. When I became a freshman I set two major goals: the first being 1,000 points and the second being breaking the school record. I feel blessed to achieve the first one,” Moorefield junior Lindsey Rinker commented.